Space Mountain is an indoor roller coaster located in the Tomorrowland section of the Magic Kingdom, Walt Disney World Resort, Florida. This article reviews the Space Mountain seats and how they are configured on the ride (seating layout). There are also other versions of the Space Mountain attraction at Disneyland California and the other Walt Disney Company theme parks around the world. The seats on Space Mountain are configured with 1 person per row and 3 persons per rocket or car. Two rockets/cars are connected together to make what we call a rocket train. Each rocket train has 6 seats with 1 person per row. With only one person per row, no one sits next to each other on the ride. A person sitting in the front row only has someone sitting behind them and everyone else on the ride has someone siting in front and behind them, except for the last seat as there is no one behind you. The seats themselves are made of some sort of leather or leather substitute and are cushioned. There is a special type of lap bar, that has a column in the middle, that is part of the seating area and secures guests on the ride. A net style bag or basket is located in front of the seat to store any hats, sunglasses, and other belongings. Make sure to take out any items you store in the bag before getting off the ride. 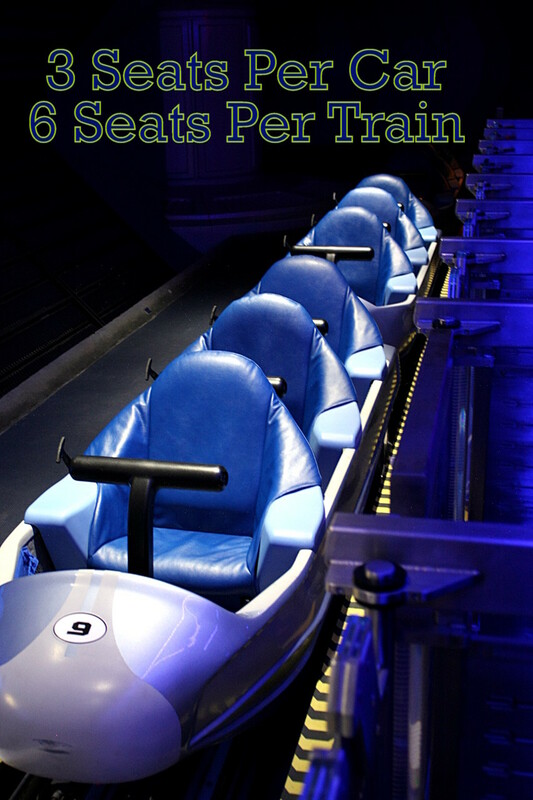 A photo of the Space Mountain seats and the “rocket train” are featured below. This will help to give you a better visual on how the seats are setup on the ride and what they look like. Above photo of the Space Mountain seats / rocket train by William M on Wikimedia Commons. Photo modified by NavFile. Image released under a Creative Commons License. The other Space Mountain attractions at the other Disney parks have different seats and seating layouts. For example, Disneyland California has a two by two seating arrangement with 6 seats per car and two cars per train or rocket train. That Space Mountain seating layout is very different then the Walt Disney World version of the ride. We may have coverage of the other Space Mountain roller coasters in the future. To learn more about Space Mountain in Walt Disney World, visit the other pages that are located here on the site.